NOTE (5 jan.): This course is almost full, if you want to take up one of the few last places please register soon, before jan. 19, 2017 (final closing date for registration). Participants come from all over the world: Singapore, The Netherlands, England, Belgium and United States. Carmen can bring you in contact with other participants if you want to travel together. In this Buddhist Art Retreat you will learn to draw & paint Guan Yin according to the tradition of Buddhist Thangka (scroll painting). 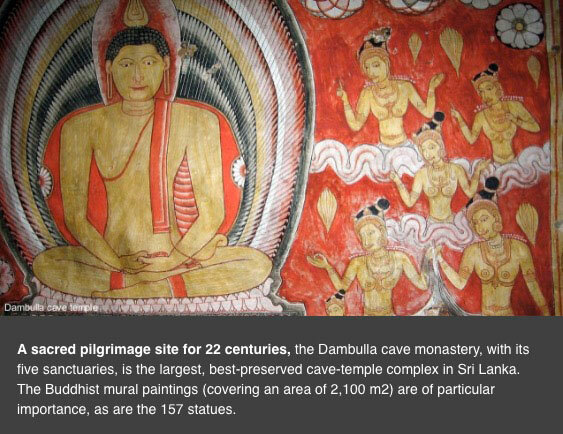 This painting retreat is extra special, because it includes a sightseeing tour where we will visit the most beautiful Buddhist sites in Sri Lanka, and look at the ancient artwork, Buddha paintings and murals. Our own buddha drawing & painting practice will make this an even deeper experience and offers a better understanding of Buddhist art. Participants will be coming from all over the world, and this course offers a wonderful opportunity to combine it with a longer vacation in Sri Lanka or elsewhere in Asia. Guan Yin, also written as Kuan Yin or Guanshiyin, may be depicted as either a male or female manifestation of Compassion. Many Buddhist agree that Guan Yin came from the male Bodhisattva Avalokitesvara. When Buddhism traveled from India to East-Asia and became especially popular especially in China, Korea and Japan, many Buddhists transformed Avalokitesvara into the female deity named Guan Yin, and we will be working with this female manifestation. She’s also known as the Goddess of Mercy. The name Guan Yin is short for Guan Shi Yin, meaning “Observing the Sounds of the World,” which indicates her compassionate ability to listen for pleas of help of those who need her. She is also associated with vegetarianism, due to her great compassion, that goes for animals as well. In this retreat we will work with 2 different forms of Guan Yin, standing and sitting, and you will learn all about this beautiful deity (through slideshows & talks), and will also make contact with her energy of compassion through the meditations that we will do in the morning. 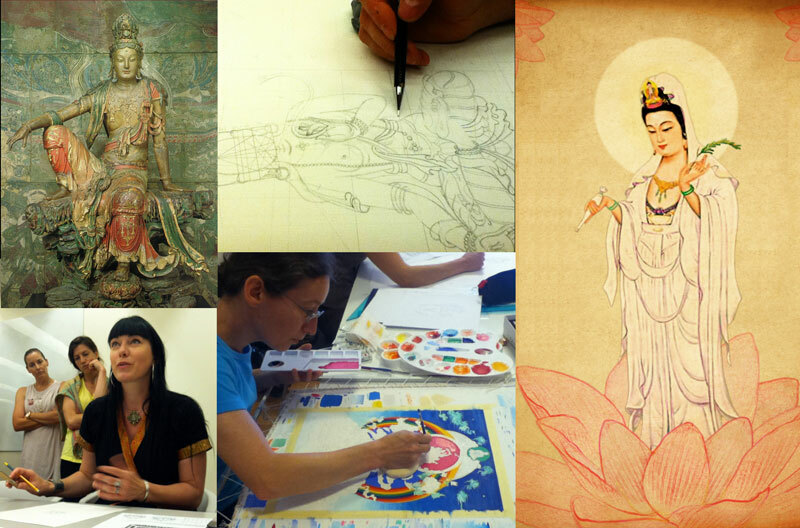 You can either choose to draw and color Guan Yin with colored pencils or paint your drawing and learn how to work with the special thangka (tibetan scroll) painting techniques. Drawing and painting experience is not necessary, enthusiasm is! 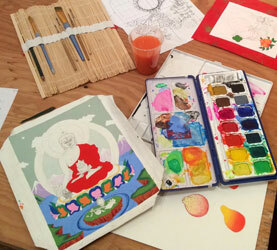 OPTIONAL: instead of Guan Yin you may also choose to draw/paint Buddha Shakyamuni or Avalokitesvara. If you prefer this, please let contact Carmen well ahead so she can prepare this for you. 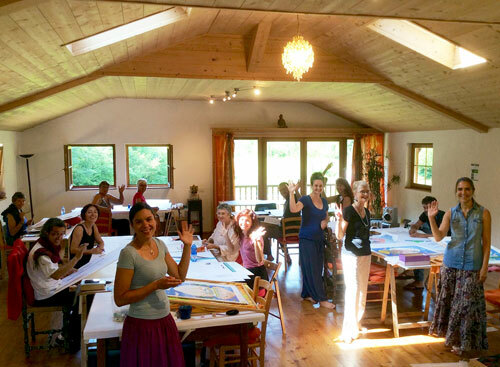 You can also use this retreat to complete the thangka drawings and paintings that you’ve previously made in a course with Carmen. 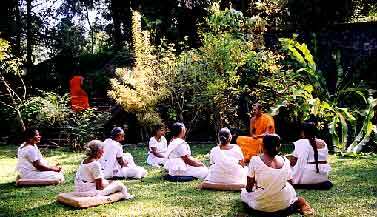 The painting course will be held at the Paramita International Buddhist Centre, in central Sri Lanka, a beautiful place to stay. You will share a room with another thangka student. More information can be found here under the pink bars. The sightseeing tour will be after the painting retreat, where you will stay in 3-star hotels, in double rooms (a single room is possible for a supplement). The complete schedule of the retreat and the sightseeing tour can be found here under the pink bars. At the bottom of the page some pictures of the places we will be visiting. After that the bus will make a stop in Colombo city or Negombo for the people who arrived before the 23rd (time and place will be announced soon). Those who missed this transit can take a cab from Colombo Airport directly to Paramita International Buddhist Centre, No. 7 Kandy Road, Kadugannawa. Arrival at Paramita Center: get settled in your room and get shown around the center and the green gardens. We will get to know each other and share out first dinner together, after which the first evening starts with a lecture & introduction of the painting course & its subject Guan Yin. 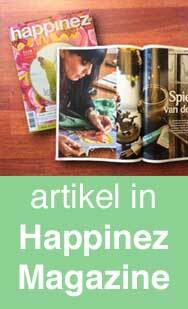 All days start with a guided meditation in the morning (optional) and drawing sessions in the morning and afternoon. Later in the week we will turn to coloring and/or painting sessions, and you will learn how to apply the special thangka painting techniques. There will be a lot of individual guidance. 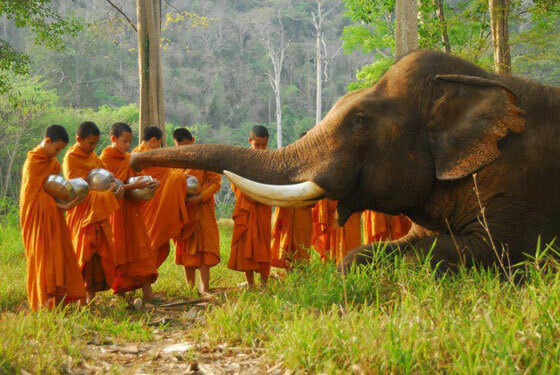 In the evenings there will be free time, a lecture on buddhist art or a film. Sunday afternoon (Feb. 26th) is free time and you can go for sightseeing (to Kandy or to the temples nearby for example) or relax and enjoy the nature & surroundings. In the evening of Wed March 1st we will pack our bags and get ready for the exiting second part of this course: the 4 day/3 night sightseeing tour. After your own Buddha drawing and painting experience you will be guaranteed to look with a different eye and appreciate the centuries old buddhist art even more. We are picked up and leave for Anuradhapura, one of the greatest and oldest civilizations in the world, that used to be the greatest city of ancient Sri Lanka. We’ll visit the Sri Maha Bodhi – the sacred Bo sapling extracted from the tree under which Lord Buddha attained enlightenment – standing more than 2200 years in its pride. 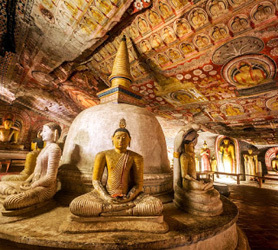 You’ll stroll through the sacred trails of the venerated city to adore the legacy that interweaves Ruwanweliseya – the gigantic dagoba resting alongside the Basawakkulama Tank – shading the Samadhi Buddha Statue & Isurumuniya Rock Temple that empower the culture, heritage and supremacy of arguably the strongest kingdom in Sri Lankan history. Lunch at a local restaurant. Dinner and overnight stay at the 3-star Hotel The Heritage. 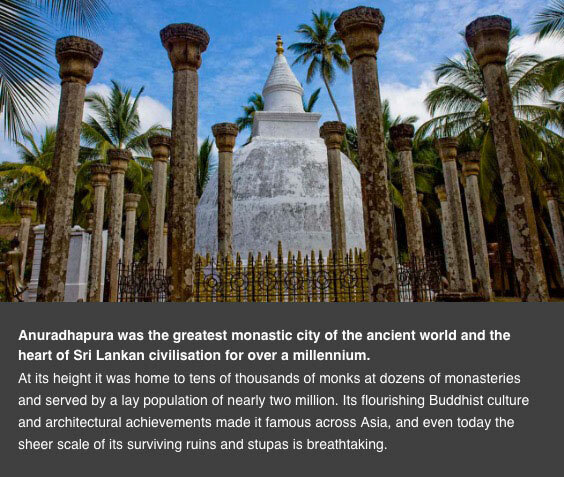 After breakfast at our hotel we will leave for a Historic City Tour of Anuradhapura, after which we will visit the city of Polonnaruwa – the medieval capital & crown jewel of King Parakramabahu I. This city remains superior proof of ancient culture & heritage blended with religious beliefs. Walk across its scattered walls of the World Heritage Site – blessed by stupas, resting Buddha statues, irrigation canals and fantastically carved Hindu sculptures – while observing the relic house – Watadage – which boasts of beautiful stone carvings. 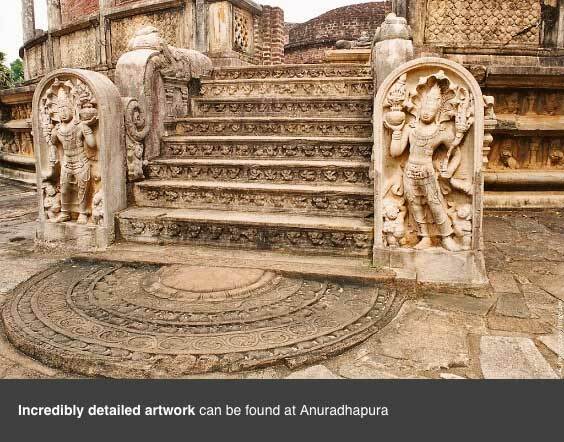 Take a close glance and you will realize a subtle Hindu influence on architecture and statues found in Polonnaruwa. Or sit by the side of Galviharaya and observe the absolute beauty gushing out of every bend of its huge Buddhist statues. Nissankamalla Council Chamber is however, a head-spinning beauty to just sit back and observe with its swaying pillars reminding the aesthetics of a powerful kingdom which rests beside Parakrama Samudraya – sea of Parakramabahu & masterpiece of irrigation. Lunch at a local restaurant. Dinner and overnight stay at the 3-star Hotel Sudu Araliya. 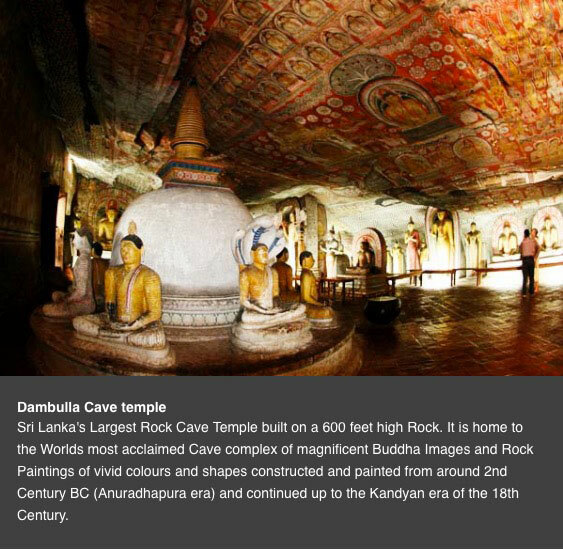 After breakfast at our hotel we will leave for Dambulla and visit the very famous Dambulla Rock Temple. Lunch at a local restaurant. Dinner and overnight stay at the 3-star Hotel Kassapa Lions Rock. After breakfast at our hotel we will leave for Colombo, the main city of Sri Lanka, and have lunch at a local restaurant. 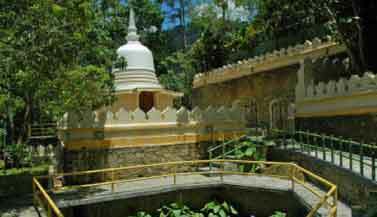 We’ll visit the Bellanwila Temple and the Kelaniya Temple. 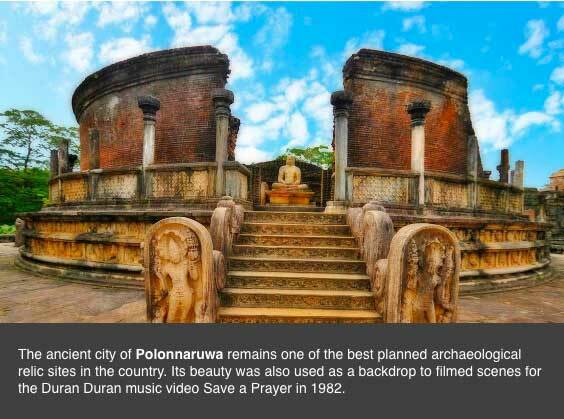 Kelaniya draws an illustrious significance towards the country along the channels of both culture and religion. 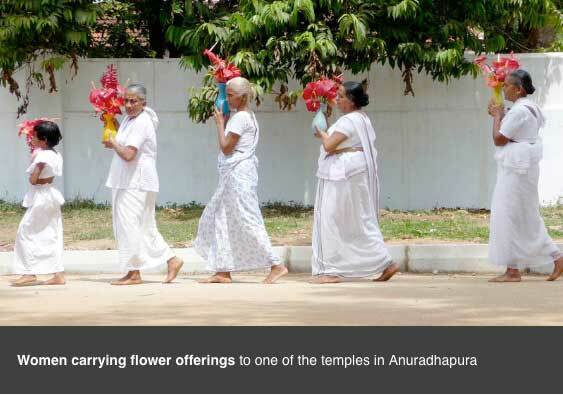 Blended with an absolute importance following the visit of Lord Buddha to Sri Lanka, the Kelaniya temple thrives today drawing thousands of heads from all corners of the world. Built during the 3rd century B.C. today, Kelaniya lights up the entire city with its annual pageant ‘Duruthu Maha Perahera’ held in the months of January studded with fire dancers, majestic elephants and drummers that add to the glory of the religious and cultural fortress. Dinner at a local restaurant and (optional) transfer from Colombo to the Airport for departure. Some people of the group will be staying in Colombo for a few more days and/or will continue their vacation in Sri Lanka (for example the beach areas), or elsewhere in Asia (Southern India for example). Flights: You have to arrange your own flight to Colombo Airport, the main city of Sri Lanka. Visa for Sri Lanka can be purchased online beforehand, or on arrival at Colombo Airport. 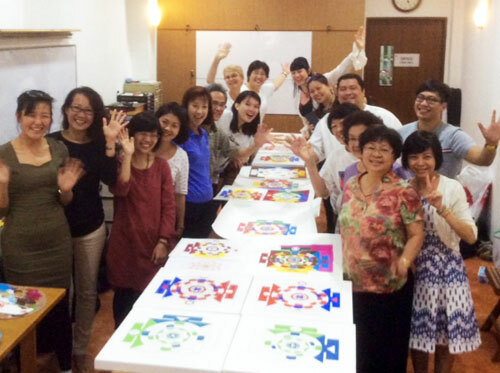 If you fly in from Singapore you can fly together with other students if you like, the Buddhist Library can introduce you to ach other. If you fly in from The Netherlands and would like to travel together with other Dutch participants, Carmen can introduce you to ach other. She can also do that for people from other countries. Dutch participants may pay directly to Carmen to avoid money transfer costs. Free transport from Colombo airport to the Paramita Centre and vice versa will be provided on Thu Feb 23rd and Sun March 5th. 2 large (A2 or larger) drawing paper, long 50cm ruler, (mechanical) pencil and eraser. Easiest for traveling is to put the paper in a tube. Kadugannawa is a town located in the Kandy District in the Central Province of Sri Lanka. It is situated approximately 100 km away from the Country’s Capital – Colombo, along the A1, Colombo-Kandy Road. 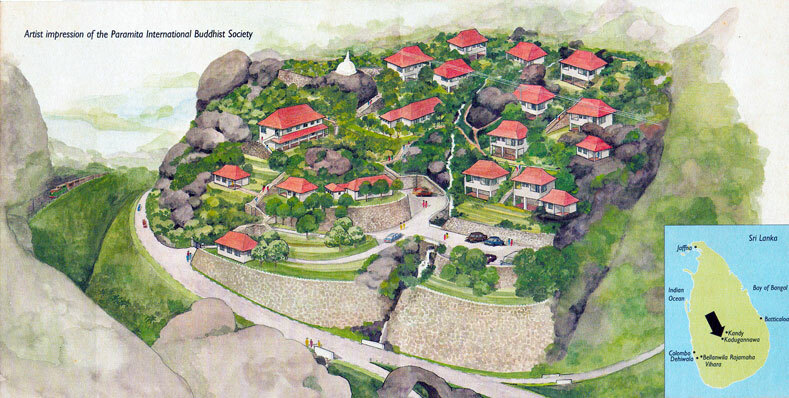 Paramita Meditation Centre is also situated along this route, and within 100 metres of the famous landmark Kadugannawa Rock Tunnel, known locally as “Gala widapu thena”.